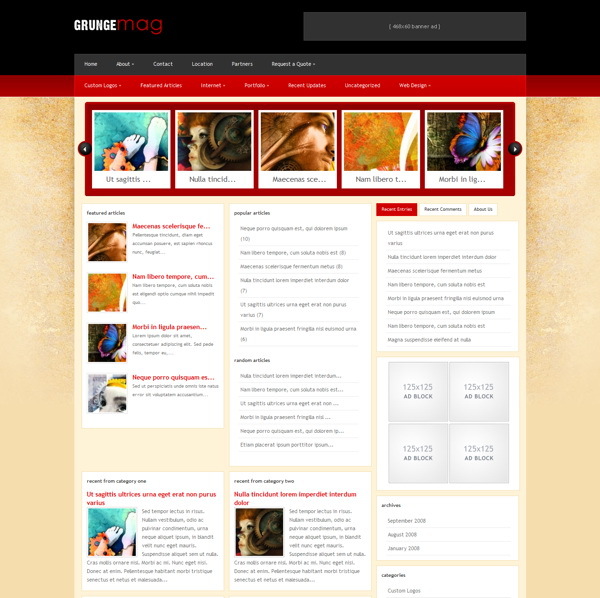 GrungeMag combines the professional and precise magazine-style-layout with a progressive grungy style. This theme is great for those looking to organize their content in an orderly fashion while maintaining a fun and appealing identity. GrungeMag comes with 3 unique color schemes. If Red isn’t your style, then why not try Cion’s Blue or Green skins? You can change your blog’s color scheme instantly and at any time from within the theme’s options menu. With the featured articles display you can choose to feature your favorite posts on the homepage. You can also choose how many featured articles to display at a time, and even remove the featured articles display entirely. This theme utilizes timthumb to automatically resize your thumbnail images. Because of this, only one thumbnail images is required per post, despite the various thumbnail sizes used in the theme.With GrungeMag you can place four 125×125 in your sidebar and a 468×60 ad to your header with ease. Advertisements are handled from within wp-admin, and can be turned on and off at any time individually.